My skin just can't catch a break during this time of the year. The cold weather dries out my skin like nobody's business, so I always make sure to stock up on products that I know will help give my skin a much needed moisture boost. When it comes to my hands though, I have to admit, I don't really give them the greatest attention that they deserve. It's an area that I tend to easily overlook when moisturizing. Shame on me, I know. It was obvious that my neglecting habits had to stop. In comes Soap & Glory's Hand Food hand cream to save the day. This Shea butter, macadamia oil, and marshmallow infused hand cream is a brilliant product, if I do say so myself. Hand Food contains a comfortable, and light creamy texture that is a pleasure to work with. It quickly absorbs into the skin without leaving behind a greasy residue, and my hands are left feeling soft and supple all day long. This stuff is like a refreshing drink for my hands. It feels so good! I like the light, fresh fragrance of this hand cream. I can't quite pinpoint what the scent is but I can assure you all that it isn't offensive in the slightest. 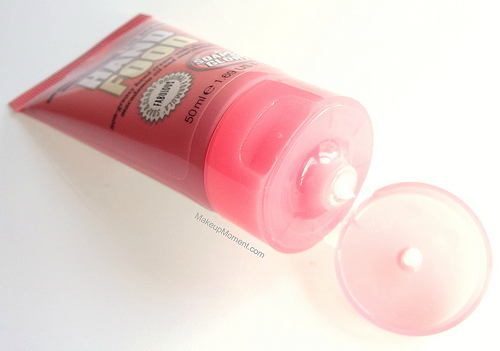 As a bonus, Soap & Glory's Hand Food hand cream is a pretty nice treat for my dry and rough cuticle area as well. After massaging a bit of this hand cream onto my cuticles, the dryness is gone, and my cuticles look and feel so much healthier. Overall: I think I have found a great hand cream in Soap & Glory's Hand Food, and it's a really pleasant hand cream to get me into the routine of moisturizing my hands frequently. I purchased this mini, travel sized tube at Sephora to try out. But I will be going back for the full size once I have used this tube up. 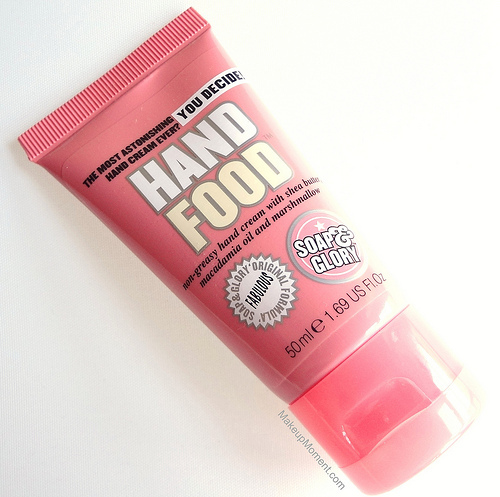 What do you all think of Soap & Glory's Hand Food Hand Cream? Which are your favorite hand creams? I heard of this product from Tiffany D...never heard of it and decided to try it and now I am seeing it everywhere!! I love it!!! I can't wait to try Soap & Glory Hand Food! I hope you love it, Faye!